In which we examine the odious delusions, bigotry, and anti-American schemes of conservatards. Lizard’s leg, and owlet’s wing. That seems eerily accurate as a description of conservatives, especially when viewing the dregs of society who support the nihilist Steve Bannon and his bloviating Putin Puppet, the illegitimate president Donald J. Trump. Not to mention the ongoing investigation into possible treason on the part of the Trumpster fire folks. Conservatives are apparently rotten to the marrow of their bones. How else to account for the hordes of uneducated, unwashed, unthinking goobers who flock to the Klan rallies held by Dummy Donny and his Rethuglican Party? There is so much hate speech and anti-American proposals coming from conservatards that the only possible conclusion is that this is a herd of pre-humanoids. Their “ideas” bear so little resemblance to those of decent people that conservatives might as well be alien life-forms. Hell, I’m surprised that they have opposable thumbs. Betsy DeVos is an anti-gay, anti-labor, anti-knowledge religiosity freak. She is also a billionaire who uses her money to harm democracy. * Betsy bought her way onto Dangerous Donny’s cabinet — she contributed to ten of the twelve regressives who were on the committee that voted for her cabinet confirmation. * Betsy and her family have given a small sum of money to the rethuglican party over the years. How much is the small sum? Oh, about $200,000,000 according to her sworn testimony. 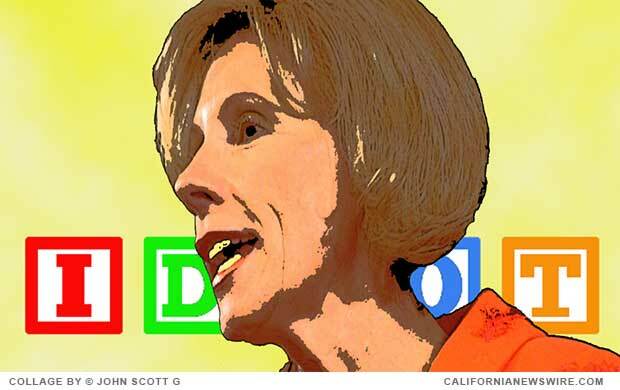 * Betsy would like to destroy America’s public education system. * Betsy would like to use your tax dollars to fund religious cult schools. And since Betsy is a privileged white ‘Murican, you can probably guess whose god she prefers. As some people have noted, Betsy DeVos is a radical Christian terrorist. Paul Ryan seems gleeful as he works to commit crimes against humanity. * Little Boy Marco voted against the Convention of Rights of Persons with Disabilities. * Little Boy Marco voted against disaster relief funding for victims of Hurricane Sandy. * Little Boy Marco voted against renewal of the Violence Against Women Act. * Little Boy Marco filibustered against the Employment Non-Discrimination Act. But he’s not always against things — Little Boy Marco voted in favor of the government shutdown. Like all conservatives, congresscritter Rubio is an anti-American clucktard. * Congresscritter King publically supported the candidacy of racist nationalist Geert Wilders in the Netherlands. Iowa’s Steve King is an open sore. Idiot’s speech with oafish spite.